Despite OPEC's strategy of flooding the oversupplied market with tons of crude, American oil production has not fallen off a cliff. And now that prices have rallied back to $50 a barrel, there are early signs that U.S. shale is on the rebound, too. Just look at how the closely-watched Baker Hughes oil rig count has stopped collapsing -- and started rising. The tally rose last week for the third-straight week, the longest streak since last August. The recent uptick represents an intriguing reversal. U.S. oil rigs had declined 20 of 21 weeks up until mid-May, when oil prices hit four-month highs above $47 a barrel. Rising rig counts could be a sign that the higher oil prices are luring U.S. oil companies to start pumping away again. That in turn may cause other drillers on the fence to add rigs of their own. "You can get a herd mentality. Nobody wants to be the last one back," said Thomas O'Donnell, senior energy analyst at consulting network Wikistrat. To be sure, the U.S. rig count remains down dramatically (79% to be exact) from the October 2014 high. And it's too early to say if the recent rise is just a blip or part of a broader trend. Still, the problem for the oil industry is that an influx of American crude may not be needed at this point -- and could actually backfire. The epic supply glut that caused crude to crash has only recently begun to ease and many believe the market is not yet in balance. Capital Economics warned in a recent report that "increased U.S. drilling activity" will "limit upside for oil prices." That could especially be true if recent supply outages in Canada and Nigeria are resolved, adding more supply to the market. 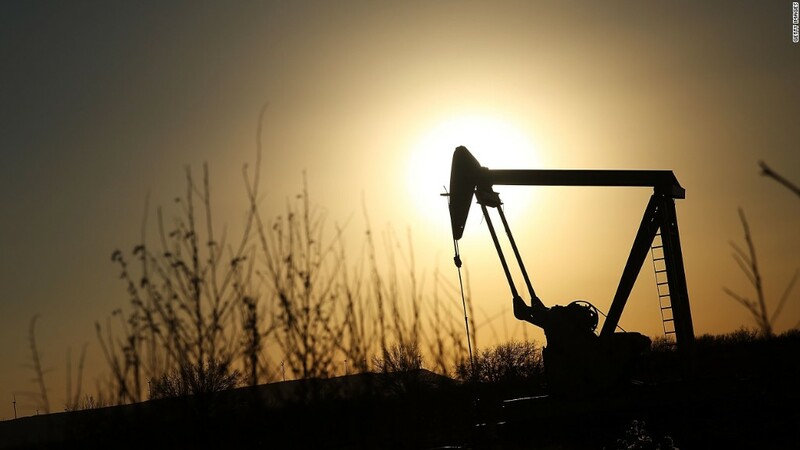 Morgan Stanley recently warned that rising U.S. supply and fading outages would renew the oversupply problem, sending oil crashing back to $30 a barrel. The U.S. oil boom has definitely taken a few punches from OPEC's price war -- and more could come. The U.S. pumped 9.1 million barrels per day in March, the latest month the Energy Information Administration has estimates for. That's down from a peak of 9.7 million in April 2015, though it's not the collapse some had been banking on. Related: What's the magic number for oil companies to jump back in? The oil industry's resilience is a reminder of how much more efficient companies have become thanks to a combination of new technology and dramatic price cuts for drilling services. In other words, many frackers no longer need $90 oil to turn a profit. "It's pretty dramatic how much costs have fallen. There have been tremendous advances," said O'Donnell. That's why a number of American oil execs have already signaled they could start pumping more at current levels. For instance, last month RSP Permian (RSPP) said $45 a barrel is an "inflection point" that would cause the oil company to think about adding a rig. Pioneer Natural Resources (PXD) also indicated it's planned to add five to 10 rigs at $50 a barrel -- a threshold hit late in May. Keep in mind that today's rigs can pump an average of 27,000 barrels of crude per day, according to Capital Economics. Compare that with two years ago when the average rig produced just 6,000 barrels a day. 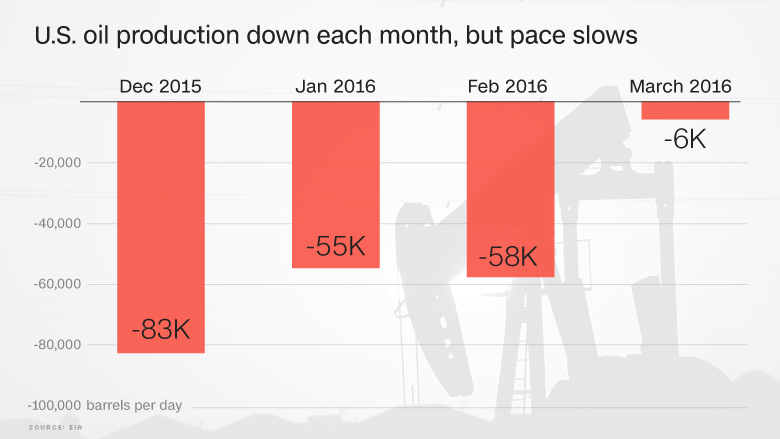 That means the rigs added in recent weeks could slow or even stop the recent decline in U.S. oil production. "Just like people didn't know the dynamics on the downside, the dynamics on the upside are a bit unknown. Shale on the rebound is a new phenomenon," said O'Donnell.